With the tax filing deadline approaching, it’s crucial that Canadians are vigilant rejecting scammers, and just as important for taxpayers to understand how and when the CRA does in fact interact with taxpayers. The information below outlines how the public can distinguish between scams and legitimate CRA phone calls, email, and hard copy mail. · you are a small business and the CRA is offering a Liaison Officer visit. 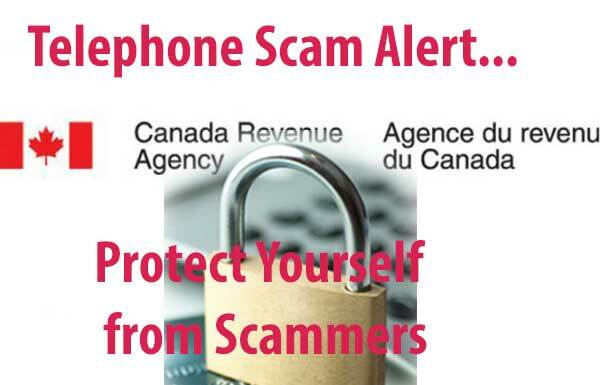 · You can then check that the employee calling you about your taxes works for the CRA or that the CRA did contact you by calling 1-800-959-8281 for individuals or 1-800-959-5525 for businesses. If the call you received was about a government program such as Student Loans or Employment Insurance, call 1-866-864-5823. · threaten you with arrest or a prison sentence. · write to you to begin an audit process. To protect yourself from scams, verify your tax status and make sure the CRA has your current address and email. · You can also call the CRA's Individual Tax Account Balance Automated Service at 1-866-474-8272. This automated phone service provides information about your tax account balance, as well as your last payment amount and date. To use this service, be ready to give your social insurance number, date of birth and the total income you entered on line 150 of your 2017 or 2016 tax return. · Call 1-866-864-5823 to update your address or contact information for government programs that you owe money to, such as student loans or employment insurance. · Why is the caller pressuring me to act immediately? Am I certain the caller is a CRA employee? · Did I file my tax return on time? Have I received a notice of assessment or reassessment saying I owe tax? · Have I received written communication from the CRA by email or mail about the subject of the call? · Does the CRA have my most recent contact information, such as my email and address? · Is the caller asking for information I would not give in my tax return or that is not related to the money I owe the CRA? · Did I recently send a request to change my business number information? · Do I have an instalment payment due soon? · Have I received a statement of account about a government program I owe money to, such as employment insurance or Canada Student Loans?